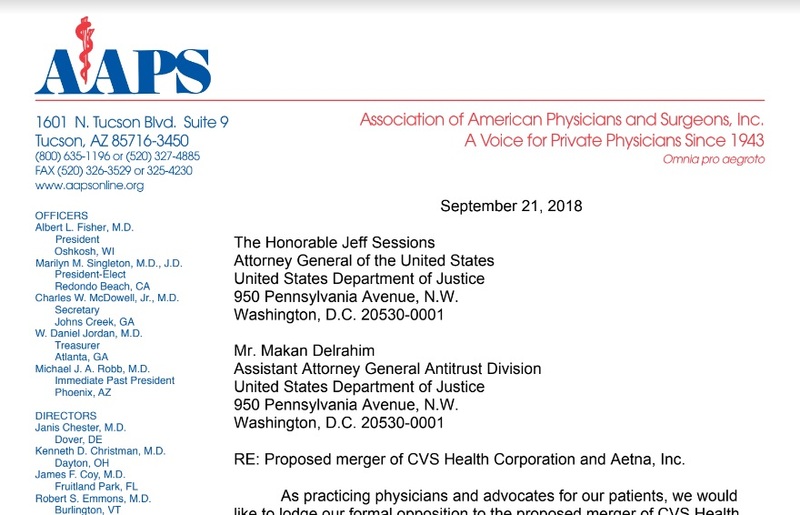 In a letter to Attorney General Jeff Sessions, President-elect Marilyn Singleton, M.D., J.D., explains why the Association of American Physicians and Surgeons (AAPS) opposes the proposed merger of CVS and Aetna. Experience has shown that mergers steer patients to insurance plans and site of care, and away from their trusted physicians, Dr. Singleton explains. CVS and its PBM gain considerable profits from such steerage. Mergers make it nearly impossible for independent pharmacies and stand-alone PBMs to compete. Patients win when there is a competitive market with independent pharmacies as well as online pharmacies. Diminishing competition means that patients will see higher insurance premiums, lower quality, and fewer novel insurance products that meet their specific needs, the AAPS letter notes. As shown in the numerous articles cited by AAPS, CVS has already demonstrated a pattern of anticompetitive behavior. For example, the price of a generic prescription jumped from $45 to $241 after CVS took over a Target pharmacy. CVS Caremark drastically cut payment rates to independent pharmacies, sometimes below cost, while inflating payments to its own CVS pharmacies. 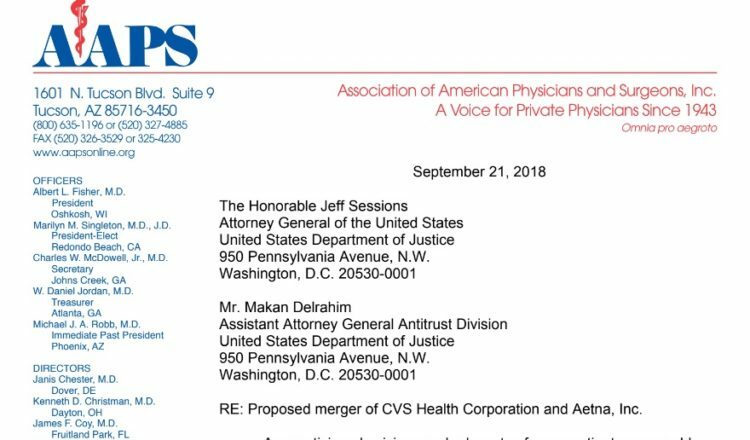 RE: Proposed merger of CVS Health Corporation and Aetna, Inc.
As practicing physicians and advocates for our patients, we would like to lodge our formal opposition to the proposed merger of CVS Health Corporation and Aetna, Inc. The Association of American Physicians & Surgeons (“AAPS”) is a non-profit membership organization of physicians and surgeons who are mostly in small, independent practices. Founded in 1943 (and celebrating our 75th year), AAPS defends and promotes the practice of private, ethical medicine. AAPS has members in virtually every specialty and State, and AAPS speaks out frequently about issues concerning patients and medical practice. It is axiomatic that mergers can decrease competition and such mergers are not in the interest of our patients. This merger combines two non-competitors: the third-largest health insurer and the largest national pharmacy chain (by locations and prescription revenue), which has the dominant pharmacy benefits manager (PBM), CVS Caremark. This merger is particularly troubling in light of the highly concentrated national market for PBM services and current lack of transparency in drug pricing and PBM contracts. CVS’s significant market position gives it the ability to influence which drugs are dispensed and what sources they are dispensed from. Approximately 70% of all prescriptions are filled by one of three PBM firms: Express Scripts, Caremark (owned by CVS), and OptumRx (owned by UnitedHealth). It is nearly impossible for new entities to enter and compete in the PBM market. As a PBM, CVS will have less incentive to keep down the cost of prescription drugs and other health care costs for other health insurers competing with Aetna. As both CVS and UnitedHealth have large pharmacy benefits businesses that would reap considerable rewards from the stream of prescriptions generated by the doctors at clinics they also own, the companies are intent on managing what type of care patients get and where they go for it. In addition to the striking examples outlined below, our patients have already told us personally about the consequences of lack of choice. The wealth of data mined from consolidation would provide the companies with a map for steering people one way or another. This merger would likely result in patients covered by Aetna being steered into receiving care at CVS-run clinics, instead of from their own trusted physician. United Healthcare has, for example, already implemented this strategy. After United Health purchases clinics, it tells patients that they have to sign up with a United-run Medicare Advantage plan or go somewhere else for care. For example, the decision by Southwest Medical Associates to stop covering traditional Medicare patients — those who don’t have private add-on coverage to supplement their federal insurance — threatened nearly 7,000 seniors in Southern Nevada with having to find new doctors. The two Medicare Advantage Plans that Southwest planned to continue to accept are issued through Senior Dimensions Southern Nevada and AARP, both of which are managed by United Healthcare. Southwest is part of OptumCare, which is owned by United Health Group. Due to public outcry, Southwest (the Optum owned clinic) decided to allow existing patients with standard part B to stay (for now). But any new Medicare patients have to sign up with United Medicare Advantage to get care at the clinic. This is still anti-competitive and proves our point that these mergers steer patients both to insurance plans and site of care. Humana is also steering its Medicare Advantage enrollees to Walmart primary care clinics (many run by non-physicians) and Walmart’s Medicare drug plan. And the stories go on. In short, our patients win when there is a competitive market with independent pharmacies as well as online pharmacies. Such mergers make it nearly impossible for independent pharmacies and stand-alone PBMs to compete. Our patients will see higher insurance premiums, lower quality, and fewer novel insurance products that meet their specific needs. CVS touts that they’re “encouraging the use of lower-cost generic drugs.” What they don’t say is that CVS is where you’ll likely find the highest prices. @ConsumerReports reveals a 1-month supply of 5 common generics would set you back $928 at CVS vs. $105 at Costco. Go #DPC and pay $29. “For a bottle of generic antipsychotic pills, CVS had billed Wapello County $198.22. But South Side Drug was reimbursed just $5.73” by CVS PBM. “CVS PBM paid independent Ohio pharmacist 18 cents per capsule of duloxetine while his wholesale cost is 23 cents. PBM charged Medicaid $1.53 per pill, pockets difference. CVS CEO “surprised” by Azar’s comments on Rx prices, while hinting at the extent of kickbacks: “Merlo said CVS has kept Rx price growth at 0.2%, despite manufacturer increases near 10%.” But how much of the “savings” is passed along to patients? CVS PBM allegedly boosts its profits by overcharging insurers for medications while often reimbursing pharmacists less than the cost of the drug. CVS uses its PBM to squash competing pharmacies while lining its own coffers at taxpayer expense, reports @WSJ. Its MO: slash payment rates below wholesale drug costs, overcharge Medicaid, then pocket the spread. “CVS Caremark PBM improperly reported generic drug prices to the federal government, causing Medicare and its beneficiaries to overpay for medicines, while pocketing a difference in pricing,” claims Aetna actuary whistleblower in qui tam complaint. CVS has demonstrated a pattern of anticompetitive behavior. Allowing this merger to proceed will hand the combined CVS/Aetna even more clout to drive up costs without any corresponding benefit to patients. It would enable, not hinder, continued anticompetitive tactics that squeeze competitors out of business and steer patients toward CVS/Aetna-controlled products, away from alternate sources of care like their trusted independent pharmacists, pharmacies, and physicians.